I understand the upgrade to the street on the soi for Boystown has begun. My understanding is it will take about 6 weeks. I hope the businesses can survive during this period. I wasn't planning on coming back till April and hope the businesses will able to survive. The bars in the XBoys Soi all managed to stay open during the work done there even if it did get a bit difficult to access at times. I don't know if it put anybody off but I could see no reduction in numbers at XBoys. Boyz Town yesterday afternoon. Looking towards Panorama Bar at the end of the soi. 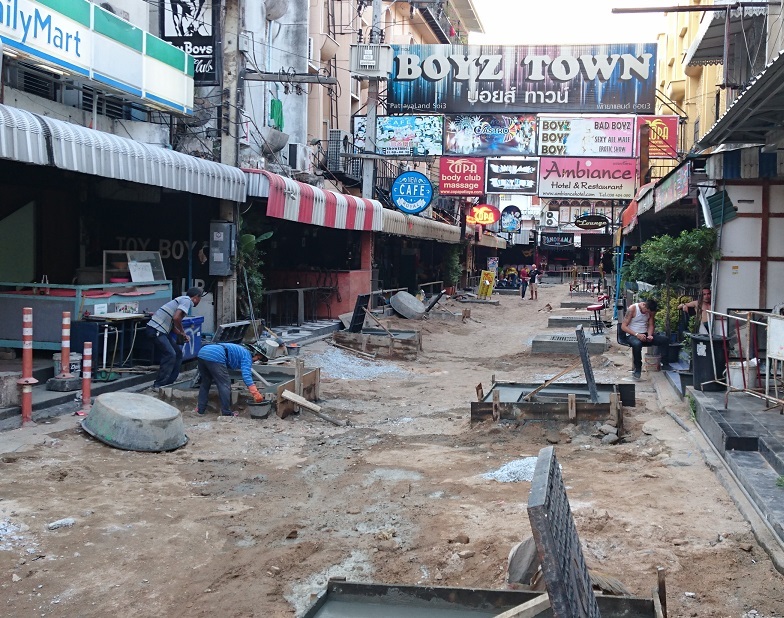 I can understand the frustration if you happen to be in Pattaya at this time and want easy access to the bars. However, the work being done on the soi is years overdue and the time to get this work done is during low season - and right now it's low season. January ( when they started it ) is supposed to be high season. However all credit for not doing it in low (rainy) season. I hear from my friends that the soi in boystown is completed. Just in time for my return in 3 weeks. They knew you were coming, so hurried the workers along. Well, they were doing the work on the nearby soi with Kawaii Boys etc in high season, but it doesn't stop the party. This is Thailand. Even with 1.5m deep holes in the road, the customer was always free to make his way past this to the bars in the evening. In Europe, some health & safety Nazi would have closed the whole street off. In Thailand, you can do as you please. As long as you are mobile, you can get to the bars. That's one area where Thailand is way ahead. Well here we are approx 1 year after the installation of a brand new concrete road surface. Boyztown has evidence of numerous repairs. The adjacent sois have a surface which has broken down in large patches. Probably no better than what was there before the work was done. Years ago I asked Jim Lumsden (of the Ambiance) If the soi was public or private. He replied when the city wanted to regulate it, it was public. When the street needed repair, it was private.